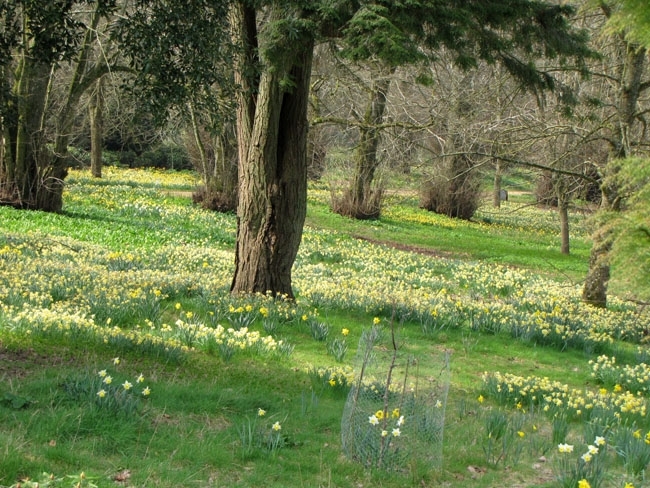 Spring is heralded with a blaze of yellow in many English gardens. Have we ever wondered why so many early flowering plants are such a bright yellow colour? 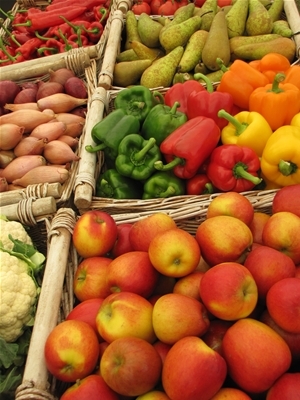 There are a couple of main reasons for this; firstly plants produce flowers in order to produce seeds, and this can only take place after the incredible processes of pollination and fertilisation have taken place. Plants that produce flowers are often reliant on insects to carry out the pollination stage and in order to attract insect visitors there must be some clever advertising tactics. Different flowering plant species have evolved different markings specific to their flowers, which is essential in order to get pollen carried from flower to flower within the same species of plant. Many patterns are invisible to the human eye but flying insects see these direction markings using their highly specialised eyesight. The shape and structure of a flower also guides the insect into the specific parts to carry out the pollen transfer from the stamen onto the stigma and therefore complete the pollination process. In late winter and early spring the numbers of flying insects can be very low so early flowering plants have had to evolve bigger and bolder coloured flowers to raise their chances off attracting these insects. Yellow has proven to be a highly effective colour to attract insects, even in lower light levels created by shorter day length. Flower initiation is stimulated largely by a process known as Photoperiodism while the term Photoperiodic refers to the shorter number of hours of natural daylight. Here are just a few examples of flowering plants that can provide such beautiful spring displays of bright yellow flowers in our gardens and parks. When planting new plants, try to position them where they will be seen from the house, so even on cold wet days we can look out and enjoy them. These plants will be available in local garden centres and nurseries and could be planted out straight away providing the soil is not too wet or frozen. 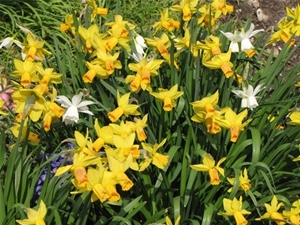 Narcissus come in many shapes and sizes; from the miniature daffodil, Narcissus cyclamineus, to the showy cultivars such as ‘February Gold’ or ‘Kingscourt’. An important consideration when selecting new bulbs is their planting location; tall varieties planted in an exposed site can be blown around and physically damaged and if planted in a rockery will look totally out of proportion and scale. The dwarf species and shorter cultivars can look impressive when planted in larger naturalised drifts in grass or shrub borders. Bulbs can be purchased in autumn for immediate planting for flowering the following spring. Forsythia are robust, hardy woody deciduous shrubs that are easy to grow in different areas of the garden. 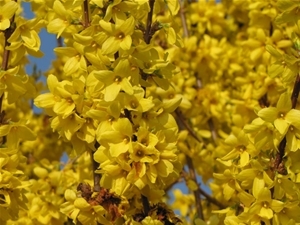 Provided the soil does not become waterlogged, forsythia will flourish in quite poor soils, including alkaline soils. In order to produce good flowering in spring ensure there is sufficient light, if positioned in heavy shade plants will become straggly and untidy with pale green foliage and fewer flowers. Do not overfeed with high nitrogen fertilisers as this will lead to soft green growth that will not support the desired mass of yellow bell shaped flowers along the stems. Pruning will be required in alternate years to remove oversized growths and maintain a denser growth habit on specimen plants. Forsythia also look good when grown as a hedge and flower well even with routine clipping. Mahonia are woody evergreen shrubs with tough prickly leaves that produce clusters of long cylindrical spikes of tiny yellow, often scented flowers at the ends of the outer stems. These dramatic looking plants can provide a focal point in any garden provided they are kept to a manageable size by selectively removing some of the older woody stems each year. This action will encourage new, basal growth that will support good flowering lower down where it can be seen more easily. Mahonia plants, if left unchecked can get tall and leggy with poor foliage low down and all the flowers too high to see and smell, the scent from these plants can be overwhelming on warm, still days and are a great favourite with many flying insects. They can be planted in semi shade and enjoy a free draining, friable soil. 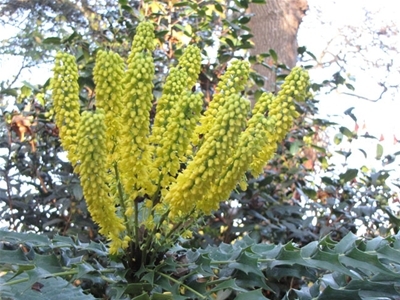 Varieties to consider include Mahonia x media ‘Buckland’ and the smaller Mahonia aquifolium ‘Smaragd’. Hamamelis, commonly known as Witch Hazels are a definite early spring show stopper in any garden. These deciduous woody plants perform nearly all year round with their new soft green foliage in early summer, their graceful shape through summer leading to dramatic autumn colour and pleasing stem formations through winter, then their delicate yellow, orange or red spidery flowers in late winter or spring. The H. mollis varieties have the added attraction of sweet scent flowers. These delicate looking flowers are remarkably hardy and when seen with a light dusting of snow, or frost look even more enchanting. These plants look their best when planted with sufficient space to grow into individual specimens especially where a darker background or other plants will act as a backdrop to highlight the flowers. 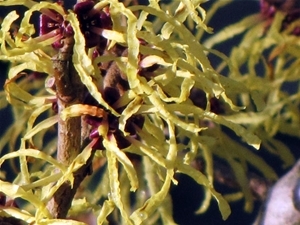 Hamamelis plants may appear expensive, especially for larger specimens, however the pleasure they will give during many, many years will be a good investment. Acacia are plants to be grown in mild areas with protection from extreme cold and high winds. Commonly known as Mimosa they grow best in full sun where they will produce an abundance of yellow flowers in late winter to early spring. The scent can be overpowering when a large plant is in full flower. 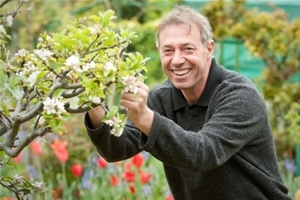 To prevent the plant becoming too tall and threatened with physical wind damage routine pruning is recommended, coppicing is often preferred to encourage low, dense growth where the flowers can be easily seen along with the soft, silvery grey foliage. In colder areas this plant can be grown indoors in a large container over winter and moved to the garden in the summer as a foliage plant, the lower light levels indoors will not initiate good flowering. 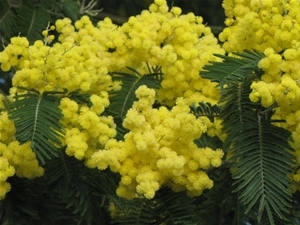 Acacia dealbata is most commonly available.